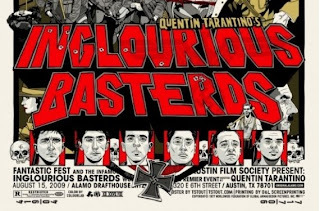 Inglourious Basterds: I'm quietly hopeful that Quentin's new movie is as great as he certainly seems to want it to be. I've been a little worried about him, as of late; while I flat-out loved Kill Bill and Grindhouse, there seemed to be a lot of self-indulgent wheel-spinning happening in those pictures. We'll see on the new one; it's getting great reviews from a lot of people I trust (Ebert, Jamie S. Rich, Brian Orndorf); Movieline is more reserved with their praise. There's a couple of other things coming out this weekend (Alexis "Rory" Bledel in Post-Grad, still-falling star Renee Zellweger in a movie I've never heard of called My One and Only), and a couple of small movies going wider (like Paul Giamatti in Cold Souls, a film that the fates continue to conspire to keep me from seeing). But it's a Basterds weekend, and it'll be interesting to see what kind of box office greets QT's latest (especially following the surprising--and underserved--financial thud of Grindhouse). On DVD: "State of Play"